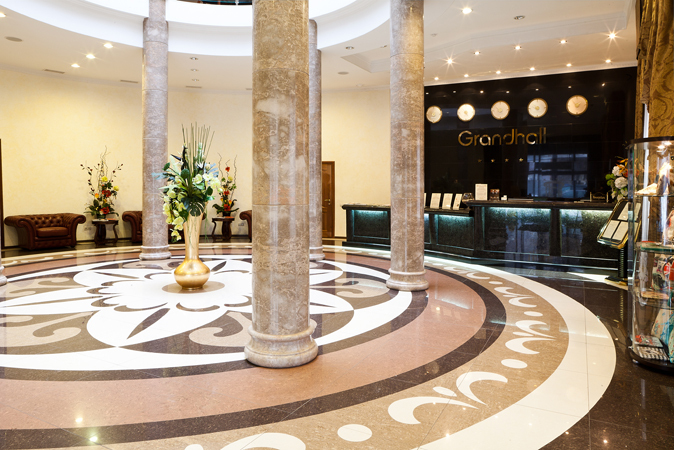 The new hotel Grand Hall is situated in a quiet part of Yekaterinburg not far from the city centre. It is a perfect place to stay if you are planning a business trip or romantic weekend. The road from the airport to the hotel takes just 30 minutes, from the railway station to the hotel 20 minutes, and from the city centre to the hotel 15 minutes only. We offer 52 spacious comfortable rooms of different categories: double and twin standart rooms, studio and suites. The spacious and fashionably furnished rooms are air-conditioned and heated. All rooms have a private bathroom with a hairdryer and bathrobe. A flatscreen TV and free Wi-Fi are available in the room. Breakfast is included. Free gym is available 24 hours. The Grand Hall features a lobby bar and a restaurant that serves traditional Russian meals. There is also a business centre and a meeting room. Wellness centre is available for an extra charge. Qualified and friendly staff will make your stay comfortable! Grand Hall hotel is a modern business hotel not far from the city centre. Weekend rate is available from 12 pm Friday till 12 pm Sunday. Breakfast is included. Weekend rate is available only for booking on the official web-site. We invite you to plunge into the comfortable world of "Richmond." In here you can feel like in the refectory of Knights Castle 17 - 18 centuries. Restaurant "Richmond" is decorated with carved pillars made of handcrafted precious wood, interior of the restaurant is so beautiful and original, so we can call it a work of art with no doubt. Hotel “Richmond” is situated on the central street of Yekaterinburg. It is the perfect place for business trip or romantic vacation. There are 49 comfortable rooms in classic style – blend of aristocratism and restraint. Attentive and polite staff will help you enjoy your stay in our hotel! Folk restaurant "Palekh" revives the tradition of the most delicious national cuisine. Here you can enjoy classic dishes of Russian cuisine - with a wooden spoon in a clay bowls and the pots. At the heart of the fabulous interior - bleached Russian stove and reproductions of Palekh miniatures on the walls.